Oak and Country Furniture encapsulates all that is quintessentially British and, in the case of the oak tree, particularly English. This may be as a result of the traditional tale that King Charles II hid in an oak tree in Boscobel whilst being pursued by Roundheads. Whatever, since then, children have worn oak leaves on May 29th to commemorate Royal Oak Day (also known as Oak Apple Day). 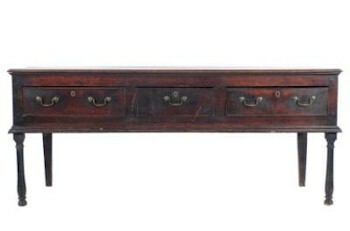 An 18th Century oak rectangular dresser base (FS18/791), which went under the hammer for £850 is typical of the oak furniture being sold in our auction rooms. The oak's Latin name is Quercus Rubber and there are about 600 species of this broadleaf deciduous tree. It is a particularly prized timber, having been used in ship building in the days of wooden ships and is ideal for furniture making because of its durability. The period principally associated with oak and country furniture runs from the 15th century to the 18th century, before more exotic woods were imported. Arguably, the most famous furniture maker of the 17th and 18th centuries is the Dutch/English sculptor and wood carver Grinling Gibbon, who was born in 1648 and died in 1721. Gibbon principally worked in lime wood and examples of his work can be seen in St Paul's Cathedral, Blenheim Palace and Hampton Court Palace. A 19th Century elm farmhouse kitchen table (FS18/798) that sold at auction for £1,100 in 2013. Bearnes Hampton & Littlewood sell a wide range of oak and country furniture, not only in our quarterly fine sales, but also in our weekly antiques and collectables auctions. In addition to oak, furniture makers also used other timbers such as yew, elm and ash aswell as fruit woods including apple, pear, cherry and mulberry in furniture construction and these are often catalogued in this category. This Harlequin set of four early 19th Century yew-wood and elm stick back windsor elbow chairs (FS18/789) fetched £1,400 in a fine furniture auction in 2013. 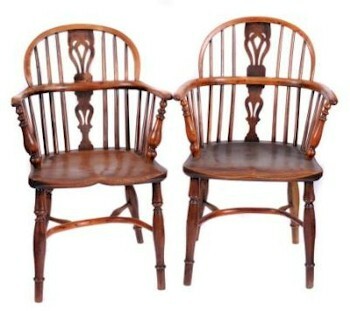 Yew-wood is particularly associated with the Windsor Chair, although they were often made in various other woods. Country chair making was particularly popular in Devon, with two chair making centres at Yealmpton and another grouped around Holcombe Rogus, Burlescombe and Uffculme. However, few examples of Grinling Gibbons work appear at auction and one associates oak and country furniture with more modest basic furniture such as coffers, court cupboards, refectory tables, benches and chairs.